If you have downloaded iPhone WiFi Transfer, do you know how to load the iPhone data to Windows PC? We have mentioned this in general in the previous articles. In this article we will explain it in details. There is no need of iTunes and USB cables. When the iPhone WiFi Transfer is running on iPhone, the IP address will be available automatically on the bottom of the screen. Then open a web browser (Internet Explorer, Safari, Firefox, Google Chrome, etc.) or run iPhone WiFi Transfer for Windows on Windows PC to load the iPhone data. Open a web browser on PC. Then input the IP address exactly as the same as the address on iPhone (including the colon and the following port number). Click the “Enter” button on the PC keyboard. 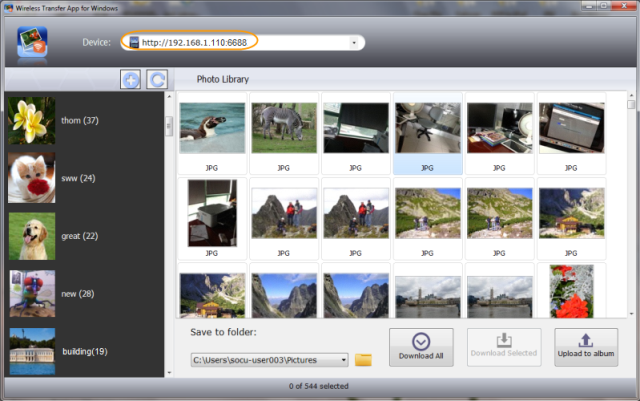 Then the iPhone album data will be loaded to the PC immediately. iPhone album data will be loaded to the PC immediately. Both the two methods are very similar to each other. The only difference lies in the web browser and the Windows app.